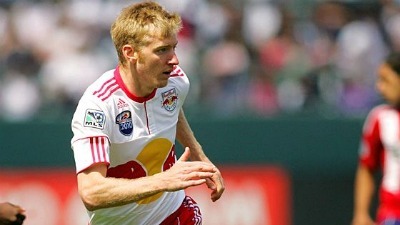 Tim Ream is set to join Premier League side Bolton Wanderers after his travel permit was granted. Scarcely over a year ago, Ream had just completed a standout 2010 season and was starting to look like the next generation of American central defenders. He played every match of his first season with the New York Red Bulls and earned a debut start with the national team in a 1-0 win over South Africa later in 2010. He was dominant in stature, had superb distribution abilities, and even scored a goal. The American soccer press pegged him as the next Bocanegra or Onyewu. All waited for what would happen in 2011. This past year was rather forgettable for Tim. He still showed well in the beginning stages of the year both with club and country. His time with Team USA took him through friendlies versus Argentina, Spain, Chile and Paraguay and to a starting spot in the 2011 Concacaf Gold Cup. With his club, things went from rosy to blood red as the experienced and opinionated Rafael Marquez blatantly suggested Tim and company were to blame for the team's defensive woes. Marquez would be moved to midfield and Keel would team up with Ream. Perhaps the ill-timed unprofessionalism of Marquez and an unstable locker room at the Red Bull Arena made it harder for Ream to concentrate. At the Gold Cup, after a great debut versus Canada, Ream committed a foul in the penalty area and cost the team the game versus Panama. He played again for the USA in October and was faulted--possibly--for Ecuador's game-winning goal due to his inability to mark his man. It was, perhaps, a comedy of errors in 2011. But Tim continued his steady presence with the Red Bulls, enough to see them through to a playoff versus eventual-winners Galaxy. Still, Tim persevered and his connections, namely Bradley and Klinsmann, allowed him to pursue training stints in Europe at Bolton Wanderers after months of scouting by teams like Arsenal, PSV Eindhoven and West Brom. We should credit a coach's vision when it comes to Ream. Clearly, the standout defender of 2010 is the person they see and the one that they keep on asking for. It is Tim's assertiveness and his control and distribution of the ball as a left-footed center back which sets him apart from other defenders. Will he get exposed in the Premier League? Yes, all of them do. Will this be a bust for the player and US Soccer? Not so fast. Ream is a mature player with two years as a professional and international experience. He is 24, not too old and not too young. He is calm and collected, patient but explosive. And, perhaps as a side note to all the doubters, it might just be that Bolton Wanderers, the Premier League, and US Soccer may have lucked out finding Tim Ream.